These workshops provide opportunities for discussion of key issues and challenges facing geoscience departments, and for sharing strategies that work in a variety of institutional settings. Program pages from past workshops include such resources as the invited speakers' presentations, participants' contributions, and any summary documents produced during or after the workshop. 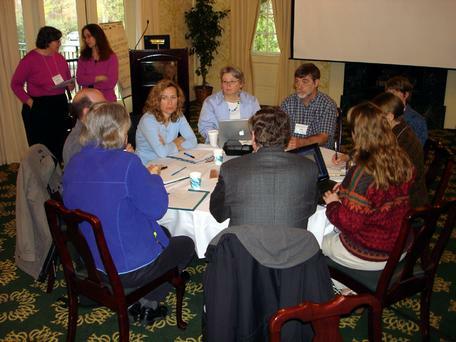 Participants at the 2007 workshop on preparing future geoscience professionals. Photo by Carol Ormand. Provenance: Photo by Carol Ormand. The Traveling Workshop Program has become a part of the NAGT Traveling Workshops Program. To apply to host one of these workshops, go to the NAGT website and complete the application process. These one-day workshops provide an opportunity for heads and chairs of Earth and Space Science departments to discuss issues and strategies for building a strong department, meet other heads and chairs, and learn more about current issues. This workshop focused on areas of high interest to participants, such as curriculum, assessment, programming, recruitment, or management. We drew on strategies and examples from past workshops to develop practical solutions to the challenges facing participants' departments. Teams of participants were strongly encouraged, particularly from departments in the mid-Atlantic states. Departments are increasingly called upon to assess the impact of their programs on students and to measure the degree to which they meet stated goals. This workshop showcased the methods and instruments that geoscience departments are using for this assessment, and also provided opportunities to learn more about evaluation theory and practice from experts in the field. This workshop explored effective strategies for recruiting geoscience majors from a variety of institutional settings. Read the brief workshop summary. This workshop explored the paired topics of where our science is heading in the coming decades and how to prepare ourselves and our students for that future. Read the brief workshop summary. This workshop explored geoscience workforce trends and how we can prepare our students for the changing landscape of their future careers. Read the brief workshop summary. The American Association of Geographers's Healthy Departments Initiative has organized a series of workshops to assist Department Chairs and facilitate sharing of successful strategies for maintaining healthy departments. Participants in this workshop shared information on strategies that had strengthened their own departments and brainstormed ideas for collective action that would strengthen departments across the United States. Read the brief workshop summary. Starting from the premise that faculty working as a department team can create stronger programs than individual faculty working alone, this workshop focused on developing a coherent curriculum for students studying the earth and planetary sciences. Participants articulated specific goals for their department and explored issues associated with building strong departments which are well-connected to other programs across campus. Macdonald, R.H., and Manduca, C.A., 2002, Developing Strong Geoscience Programs and Departments, Eos Trans. AGU, 83(47), Fall Meet. Suppl., Abstract ED52A-0002. This workshop asked participants to articulate their goals for their department and to consider how to implement changes to meet the goals. It explored issues related to the developing of students' skills across a departmental curriculum and associated co-curricular activities. Participants discussed over-arching issues related to working at the departmental level, including strategies for implementation of changes and assessment of departments and programs. During the 2009-2010 academic year, we initiated a program of traveling workshops for individual geoscience departments. Departments selected topics of high interest from a list of our areas of expertise. Two of our workshop leaders worked with the department to develop a program and deliver the programming on (or near) campus. Each session included presentations, discussions, and action planning focused on topics selected by the department. Each workshop program featured concrete examples drawn from the leaders' experience and from the collective experiences of the geoscience community. All workshops also incorporated information on building departmental consensus and assessing departmental efforts.